Will this strategy be effective? Who knows. But if a recent Wall Street Journal editorial is indicative, it’s going to provoke conservatives into making some very silly arguments—as they try, desperately, to downplay the Kochs’ influence. But is it really so extraordinary? 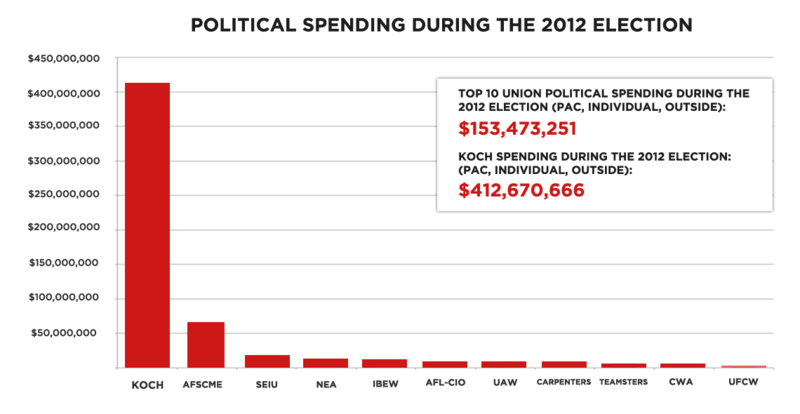 It’s true that labor unions and their members made far more political contributions than the Koch Brothers and their affiliates did. It’s also a misleading comparison. There are 14.5 million people in the labor movement, according to the latest government statistics. There are exactly two people in the Koch brotherhood—Charles and David Koch—plus another 350 or so self-identified Koch employees who, over that same time period, made direct campaign contributions. Extrapolate from that math, and you’ll see that the donation per Koch Industries affiliate positively dwarfs the donation per union member—by a factor of around 1,000, give or take. But that wasn't Strassel's most egregious argument. By focusing on direct contributions to the parties and the candidates, she did what conservatives defending the Koch brothers almost always do. She severely downplayed the primary way the Kochs influence politics—through unregulated, indirect financing of conservative political organizations. According to research by Robert Maguire, a researcher who pieced together the Koch money trail from disparate Internal Revenue Service and Federal Election Commission reports, conservative nonprofit organizations that received large grants from Koch-backed intermediaries spent $170 million during the 2012 election cycle. Unions spent just $24 million. The comparison is not precise, but it’s good enough to get a sense of scale. Using the same basic math—the Koch-affiliated organizations have about 200 supporters, including the Koch brothers, according to Maguire—that works out to about $850,000 of influence per Koch brother and $1.65 per union member. At that level of donation, it would take about 515,000 union members to have the same influence as just one Koch brother or affiliate. Of course, all of these comparisons are imprecise. It’s virtually impossible to measure accurately how much any individual or group puts into politics, given how much of that money flows through relatively unregulated channels. (One of the best I’ve seen has appeared at Republic Report, complete with a nifty graph of its own.) But very rough measurements convey who has the most power in American politics. Only a handful of individuals in the U.S. can exert the level of influence that the Koch Brothers can—and you can be certain none of them is trying to get by on a union wage.